I have a teenage son. He eats all the time, as teenage sons do, and reaches more often for whatever is quick and convenient. He truly is a bottomless pit. And you know what? I can be one too. Spiritually speaking that is. 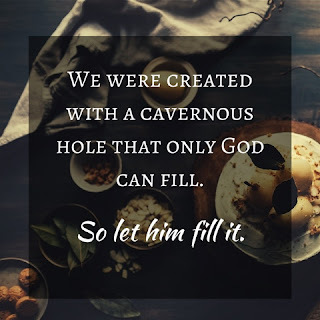 See, we were created with a cavernous hole that only God can fill. Because of this, we have a constant hunger in our spirit. And much like a teenager, we don't always reach for the best things to fill it. We tend to reach for people, asking them to fill the emptiness inside of us and getting upset when they cannot. We reach for success, feeling less-than when we don't reach the mark we've set for ourselves (one often set by comparing our lives to others). We reach out for money, but when it's bought us everything on our list and filled our bank accounts, we still feel empty. Even gaining status or the title you strive for doesn't satisfy for long. That list can go on. Some of us even reach for alcohol or drugs to try and fill what has left us feeling so hollow. But nothing can fill the spot meant for God. This yearning is supposed to be here because it's meant to make us hungry for him. And when we turn to him, when we seek him, he is faithful to fill us to overflowing so that we will never be hungry or thirsty again. What are you trying to fill your bottomless pit with today? If it's anything other than Jesus, let go of it right now and turn to him. He's right there waiting with all you'll ever need. I'm a homeschooling mom of three who is completely and utterly in love with my husband of twenty-one years. But the ultimate Love of My Life is Jesus Christ ~ my Savior, Redeemer and Friend. He's given me a passion for words: reading, writing, chatting...and this little corner of the world is where I get to share that with you. Welcome!